PREMIERING MAY 2019 IN OJAI’S LIBBEY BOWL! GET YOUR TICKETS NOW! Purchase VIP tickets for either night and be seated in the first 4 rows PLUS mix and mingle at our exclusive pre-concert VIP Party, featuring wine, food and a talk from some of our professional opera singers and our world-class composers! Click the ticket button and select VIP. JOIN OYO-- Register FOR SUMMER INTENSIVE WORKSHOP! THE FIRST YOUTH CAST REHEARSAL IS IN THE BOOKS! Head over to our NEWS page to take a peek! OYO is proud to announce our first original commissioned work, scheduled to premiere in Spring of 2019 at Ojai’s Libbey Bowl! A Story about the delicate balance children must tread between technology and the environment, NIGHTINGALE AND THE TOWER is an electronic Chamber Opera created for eight professional adult singers from the Opera world, 28 Youth Company members, ages 7-18, orchestra, synthesizers and long-string harp. Combining elements of digital and acoustic sounds, this pioneering new work from groundbreaking classical composer, Jason Treuting and Grammy Award Winning folk-rock musician, Mikael Jorgensen, melds the elements of a rich neo-classical score, alongside electronic and synthesized textures to create a bold, multi-disciplinary work of art never before seen. As promised, after the success of 2017’s featured production, Brundibár, OYO is committed to creating original works with a socially conscious message for youth and we are thrilled to birth this relevant story here in Ojai, with some truly outstanding musicians. Jason Treuting has performed and recorded in venues as diverse as the Brooklyn Academy of Music, the Walker Art Center, the Knitting Factory, the Andy Warhol Museum, Zankel Hall, Lincoln Center, DOM (Moscow) and Le National (Montreal). As a member of So Percussion, he has collaborated with artists and composers including Steve Reich, David Lang, John Zorn, Dan Trueman, tabla master Zakir Hussain, the electronic music duo Matmos and choreographer Eliot Feld. Treuting’s many compositions include his album Amid the Noise, and contributions to Imaginary City, an evening length work that appeared on the Brooklyn Academy of Music’s 2009 Next Wave Festival. Jason is co-director of the So Percussion Summer Institute, an annual intensive course on the campus of Princeton University for college-aged percussionists. He is also co-director of a new percussion program at the Bard College Conservatory of Music, where So Percussion is ensemble-in-residence beginning fall of 2011, and has taught percussion both in masterclass and privately at more than 80 conservatories and universities in the USA and internationally. Ojai’s own Mikael Jorgensen is an electronic musician, pianist, keyboard player and a member of the Grammy Award winning alternative rock band, Wilco. His wide-ranging education, including studies in fine arts, video, electronics and computer science, provides him an extraordinary base for his work as a master of modern-digital and retro-analog production. Mikael joined Wilco in 2002 to perform real-time sound manipulations. He gradually moved onto the stage itself, manning his laptop as well as taking on more and more keyboard duties. Wilco's numerous industry awards include seven Grammy Nominations; winning two for the 2005 release, A Ghost is Born. Other collaborations include his duo Quindar, with art historian James Merle Thomas, which combines historical research with musical performance, utilizing NASA archival audio and film to create ambient, electronic, and experimental music. He also shares numerous albums with longtime music collaborator, Greg O’Keefe. Exploring the themes of technology in the digital age, Nightingale and the Tower seeks to examine the delicate balance between nature and technology and the ways in which children serve as a bridge between the creative and destructive forces of both. Utilizing the sonic texturing of synthesizers, ambient sounds, children’s chorus, opera soloists, percussion and chamber orchestra, performing real-time sound manipulations with acoustic instruments and classical voicings, Nightingale and the Tower will trigger live samples that blend hypnotic rhythms with a lyrical compositional style never before seen. This opera, created with a youth-centric message begs the question, how does technology shape us from children into citizens and how can it best be utilized to bring about positive change in the world? Can the mimicry of nature allow us to harness technology into a tool for creativity and possibility, or does it limit and divide us? What is the responsibility of future generations to honor its influence as it becomes an increasingly potent part of the human experience? We can’t wait to pioneer this brand new piece of music with our exceptionally talented company of young artists!! Rebecca performing excerpts from NIGHTINGALE & THE TOWER at the CONNECT BEYOND Festival. 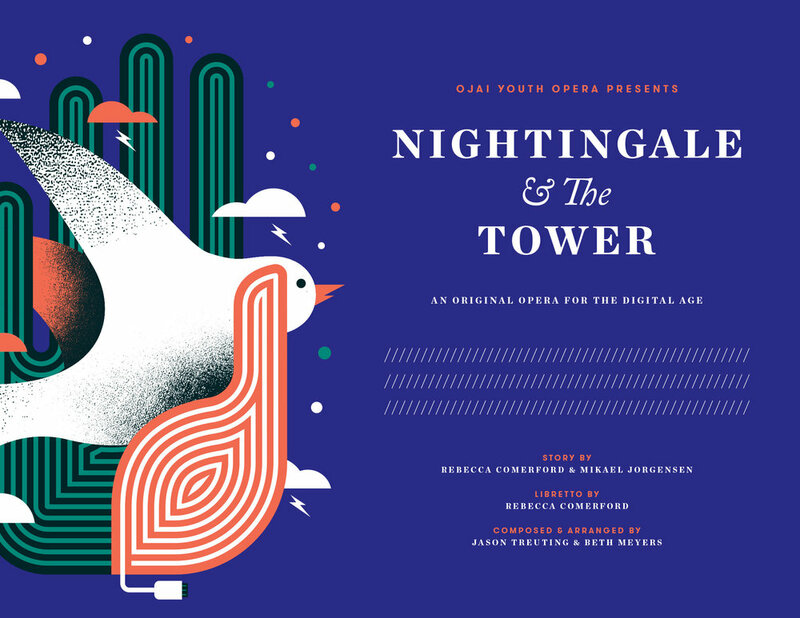 OYO Founder Rebecca Comerford & NIGHTINGALE co-writer Mikael Jorgensen performed excerpts from our upcoming World Premiere NIGHTINGALE & THE TOWER at the CONNECT BEYOND Festival.